This is my first official AI post, I am so thrilled to be apart of this awesome Design Team and look forward to challenging myself and thinking outside the box and grow my creativity .Today’s challenge is a Get Well Soon card , I choose to get out my ” Bird-Brains” stamps , these chickens make me smile and they say laughter is the best medicine . 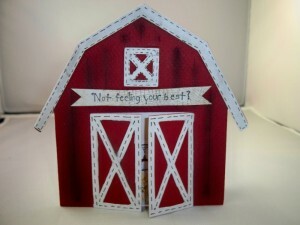 Today I got out the cricut to cut the barn used in my card , cut at 51/4″ from the Old West cartridge pg 66 , next I chalked the panels on the barn in a dark cocoa , did a little faux stitching on the door and window panels , then I cut a white card base to go under it , I cut open the barn doors and this is where the fun began .. I took U1836 Birdie & Eggnus and inked up the nest straw with a mustard marker and a cocoa marker and stamped out a nest ( when you use markers to ink your stamps you can pick and choose what part of the stamp you want to use, I only needed the nest ) , then I stamped the D1878 Fainted Chicken in the nest ( he is flat on his back in bed , we have all been there a time or two ) , I colored him in and the went over him with a Clear Spica marker ( to add some sparkle to his white feathers ) , them I laid a mask over him and shaded him with soft suede ink . Next I used I1848 Stay in your nest for my sentiment , the top part was inked with a marker and I made a banner on the front of the card , then I inked up the rest of the sentiment with markers to color certain words to make then stand out , then I masked those words off and stamped the Y 1874 Chicken Wire of that , then I inked the edges in soft suede for an older antique look .I hope you get a chuckle out of this card as much as I did , now go have and AI day ..
Great idea!!! 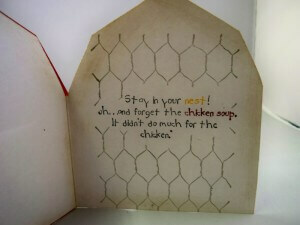 Love the card and the poor chicken – lol! 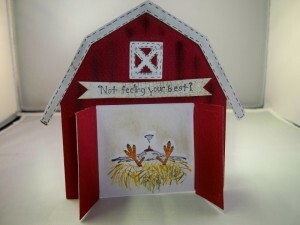 The detail on the card is wonderful – the straw, the masking for the chicken wire, all the faux stitching, and using the chalk on the barn. Smiles!! This is fantastic!!!!! Definately going to use this idea!! WOW!